Grandmothers With A Traditional Coach Built Pram! £150 FEE. I am writing a feature for the Femail section of the Mail, about the resurgence in popularity of traditional coach built prams. 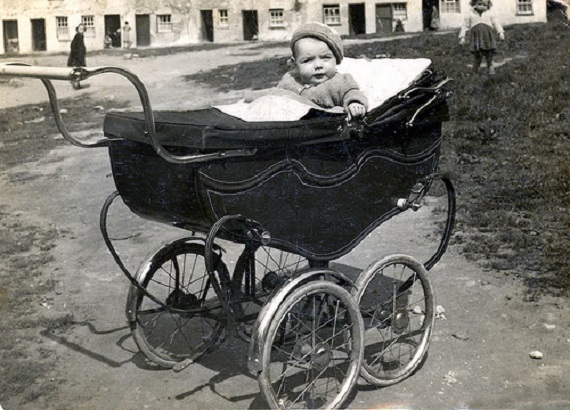 I'm looking for grandmothers who have kept the pram they used for their own children - it will now be considered vintage (eg a Silver Cross, Millson Prince, a Fethalite, a Marmet...open to other brands too). Crucially they must have photos of themselves with their own children in it AND ideally photos of their grandchildren in it (or be able to take a photo with a grandchild in it) as we'd like to show how these prams have served generations of children in a family. There is a £150 thank you fee paid on publication of the article - taking part will involve a short phone interview and having some photos taken with your pram. I had a second hand silver cross pram. When my two were finished with it, I passed it on to a friend. Goodness knows where it might be now. I'd a beautiful second-hand navy Royale. It handled like a dream, even with a baby seat atop it, more often than not containing a grumpy looking DD1 covered in a bright red rain cover. Sorry, though, I sold it on thirty odd years ago. Is there really a resurgence? It hasn't reached us up North yet! Most of the mums I know wouldn't have anything you couldn't fold up and put in the car. They were lovely though. Held 2 children, shopping, lunch boxes, coats and anything else you wanted. Mine went years ago. I've still got the pram my four children used in the loft. It would probably do another four babies, if their parents had a pantechnicon to transport it! My sister had an enormous twin pram, when the hoods were up she couldn’t see over the top! Her eighteen month old sat at one end while the babies were cuddled together at the other end. I had my Silver Cross Coach Built Pram for my DS1 & DS2 it was bottle green with white interior a lady from St Johns Market in Liverpool made me a green and white bobble blanket for it and I thought it was the bee's knee's,it went to my DD and she had it for 3 babies then sold it for a tidy sum. I offered to buy a new one for my DS1 and his wife for the baby they have just had but she didn't want one she said it was far too big for their hallway. I have very large Marmet coach built pram in excellent condition. All three of my children 34,32 and 24 used it and it was very long and i loved it because they all slept in it until over 1 year old lying flat. I was hoping my dd would want it for dgc but sadly she wanted much smaller one that folded into car and had click in car seat. Mine was dark brown with fringing on edge of hood. I don't think i have photo of dc in it though. I did have a lovely Silver Cross coach built pram, navy blue and white, my mum bought for me. I remember my eldest daughter at 2 years old scrambling on to the wheel guard to peer at her newly born sister (and at one point trying to give her a sweetie!). It was such a really lovely pram and so useful to have at the back of the sitting room, and baby outside in the back garden. I am sure there is a picture of the pram somewhere. I don't have the pram any longer unfortunately. I know where all the coach built prams are!!! Took my DGS to nursery the other day and had to go to the outside area. I knew they had a few prams and children are put outside to sleep in them in good weather, but there were around 15 in the area leading to outside. They must have been collecting!!!! Mine was a Royale too,Maggiemaybe. It was cream and beige and like you said, a dream to push. They were much better prams than they are now far more comfortable. I sold it and bought a pushchair big enough for the two of them and shopping as well. Only baby was photographed in it as I was the one taking the pic.